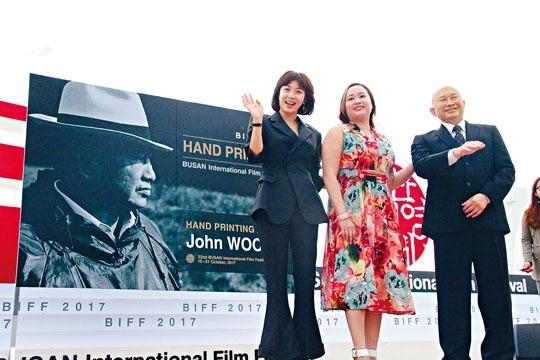 Director John Woo (Ng Yu Sum) recently attended Busan Film Festival activities in Korea. Yesterday he led his film MANHUNT's lead actress Ha Ji-Won, Angeles Woo Fei Ha to promote the film. Director Woo attended a hand printing ceremony on the beach of Haeundae. Korea star Ha Ji-Won took time from her busy television series shoot schedule to show her support. 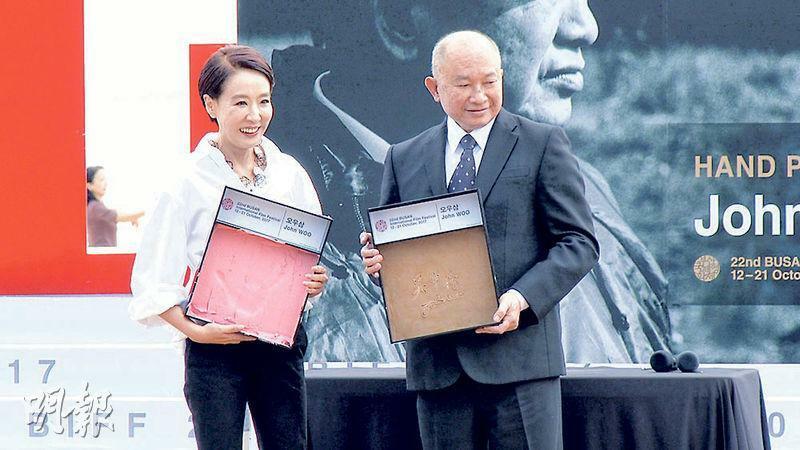 After the ceremony Director Woo joked, "The hand printing ceremony is like a wedding. Today I married the Busan Film Festival!" Ha Ji-Won's appearance caused a stir immediately. She went to the crowd to sign autographs and pose for photos with fans. She also blew kisses and was very friendly. Director Woo has been making movies for over 50 years, almost every one was a men's films. MANHUNT was the first film in which he added a "female killer" role and a female star firing a gun. Director Woo praised Ha Ji-Won and said, "When I met Ha Ji-Won I fel that she was very suitable to play the female killer. During the shoot she even displayed her agility, intelligence and professionalism. I was very pleased." As Director Woo's first female killer, Ha Ji-Won was surprised. "Director Woo took great care of each and every actor. On the set I was very comfortable. I have always liked Director Woo's movies. Many of his past films had killer and gun fight scenes, all of which were very exciting and spellbounding. Yet they were never women. MANHUNT was the first to have a female killer role. I never expected that female killer would be me. I felt very happy and honored." Director Woo's daughter and actress Woo Fei Ha were as close as sisters on and off camera with Ha Ji-Won. She thanked Ha Ji-Won for taking care of her on the set. Ha Ji-Won gave her a pat on her shoulder in response and the audience applauded. Last night they continued to attend the MANHUNT Korean premiere and forum.